Oneida County is part of the Pioneer Trails Region an area of many roads and trails that passed through it, including part of the Oregon Trail. A number of old roads passed through the Malad Valley,including the Oneida Wagon Road, a toll road that ran from Malad to Blackfoot, Idaho. Also known as the Gold Road, it had a reputation for bandits who repeatedly robbed the stages that carried gold from Montana gold mines to Salt Lake City. It is said that some of the robbers’ loot is still hidden in the Samaria Mountains behind an iron door, though no one has ever found it. 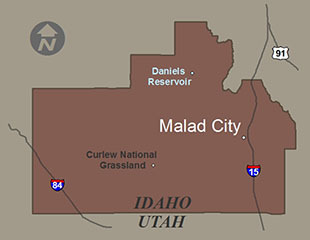 The first European-Americans to settle the Malad Valley came in 1854 to raise horses and hay for the Ben Holliday Stage Lines, but they left because of conflicts with the Indians of the region. Settlers returned in 1864 and established irrigation canals and farms in the area that now is Malad City. Most of the early settlers were Welsh Mormons, and some of the minutes from early town meetings were taken down in both English and Welsh. The western part of the county is home to the Curlew National Grassland, where the Dust Bowl drought left the land severely eroded. Today, the area is a model for land reclamation.